Rabbit anti Human HLA DRB1 antibody recognizes HLA class II histocompatibility antigen, DRB1-3 chain, also known as DR-1 beta chain, MHC class II HLA-DR beta 1 chain, MHC class II HLA-DR-beta cell surface glycoprotein, human leucocyte antigen DRB1 or lymphocyte antigen DRB1. The HLA-DRB1 gene belongs to the HLA class II beta chain paralogs. The class II molecule is a heterodimer consisting of an alpha (DRA) and a beta chain (DRB), both anchored in the membrane. It plays a central role in the immune system by presenting peptides derived from extracellular proteins. Class II molecules are expressed in antigen presenting cells (APC: B lymphocytes, dendritic cells, macrophages). The beta chain is approximately 26-28 kDa. It is encoded by 6 exons. Within the DR molecule the beta chain contains all the polymorphisms specifying the peptide binding specificities. Hundreds of DRB1 alleles have been described and typing for these polymorphisms is routinely done for bone marrow and kidney transplantation. DRB1 is expressed at a level five times higher than its paralogs DRB3, DRB4 and DRB5. DRB1 is present in all individuals. Allelic variants of DRB1 are linked with either none or one of the genes DRB3, DRB4 and DRB5. There are 4 related pseudogenes: DRB2, DRB6, DRB7, DRB8 and DRB9 (provided by RefSeq, Jul 2008). 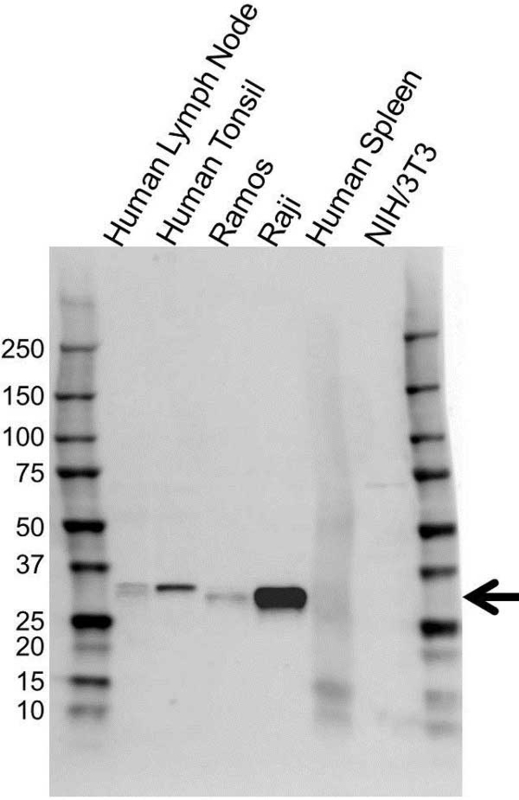 Rabbit anti Human HLA DRB1 antibody detects a band of 29 kDa. The antibody has been extensively validated for western blotting using whole cell lysates.